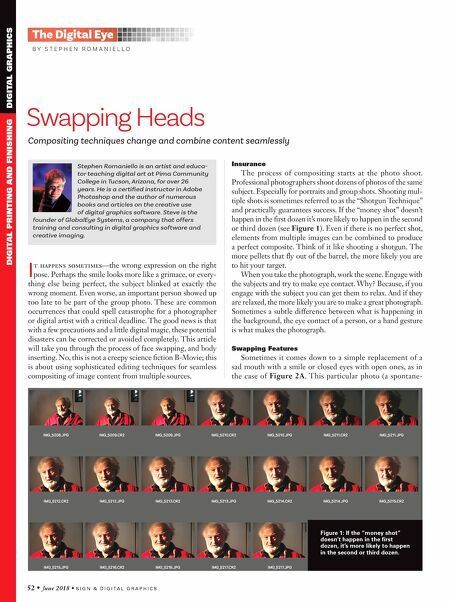 52 • June 2018 • S I G N & D I G I T A L G R A P H I C S DIGITAL PRINTING AND FINISHING DIGITAL GRAPHICS Swapping Heads Compositing techniques change and combine content seamlessly Stephen Romaniello is an artist and educa- tor teaching digital art at Pima Community College in Tucson, Arizona, for over 26 years. He is a certified instructor in Adobe Photoshop and the author of numerous books and articles on the creative use of digital graphics software. Steve is the founder of GlobalEye Systems, a company that offers training and consulting in digital graphics software and creative imaging. B Y S T E P H E N R O M A N I E L L O The Digital Eye Insurance The process of compositing starts at the photo shoot. Professional photographers shoot dozens of photos of the same subject. Especially for portraits and group shots. Shooting mul- tiple shots is sometimes referred to as the "Shotgun Technique" and practically guarantees success. If the "money shot" doesn't happen in the first dozen it's more likely to happen in the second or third dozen (see Figure 1). Even if there is no perfect shot, elements from multiple images can be combined to produce a perfect composite. Think of it like shooting a shotgun. The more pellets that fly out of the barrel, the more likely you are to hit your target. When you take the photograph, work the scene. Engage with the subjects and try to make eye contact. Why? Because, if you engage with the subject you can get them to relax. And if they are relaxed, the more likely you are to make a great photograph. Sometimes a subtle difference between what is happening in the background, the eye contact of a person, or a hand gesture is what makes the photograph. Swapping Features Sometimes it comes down to a simple replacement of a sad mouth with a smile or closed eyes with open ones, as in the case of Figure 2A. This particular photo (a spontane- I t happens sometimes—the wrong expression on the right pose. Perhaps the smile looks more like a grimace, or every- thing else being perfect, the subject blinked at exactly the wrong moment. Even worse, an important person showed up too late to be part of the group photo. These are common occurrences that could spell catastrophe for a photographer or digital artist with a critical deadline. The good news is that with a few precautions and a little digital magic, these potential disasters can be corrected or avoided completely. 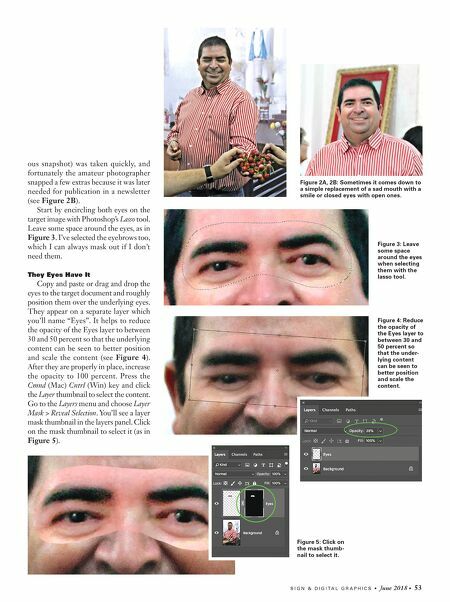 This article will take you through the process of face swapping, and body inserting. No, this is not a creepy science fiction B-Movie; this is about using sophisticated editing techniques for seamless compositing of image content from multiple sources. Figure 1: If the "money shot" doesn't happen in the first dozen, it's more likely to happen in the second or third dozen.